India produces up to 1-billion kilograms of tea annually. This makes India the top tea producer on the planet and the fourth largest tea exporter. Kenya, China and Sri Lanka are the top three. Tea is such a massive commodity in India that a board had to be formed to handle all aspects. The Tea Board of India controls regulations, research and even promotions. The Board tracks the quality of the tea grown in India and works with growers to develop ways to improve upon the existing quality. The Board also provides assistance to all size producers within the industry. In addition to producing a high volume of tea, India also consumes a great deal of the beverage. The country drinks no less than 19% of the total amount of tea consumed in the world. In fact, roughly 76% of the tea produced in India is enjoyed in the country of origin. That figure leads all other global tea producers which typically export more tea than they consume. India is also unique in that nearly every part of the country has a tea-growing region. There are over 14,000 tea estates in operation over 15 different Indian states. The combination of spices that are added to black tea to create this aromatic and flavorful drink is a very popular and tasty option. The mixture includes cinnamon, ginger, cloves, herbs and elaichi. You can drink Masala Chai tea to combat body inflammation. It can also assist with beating fatigue. 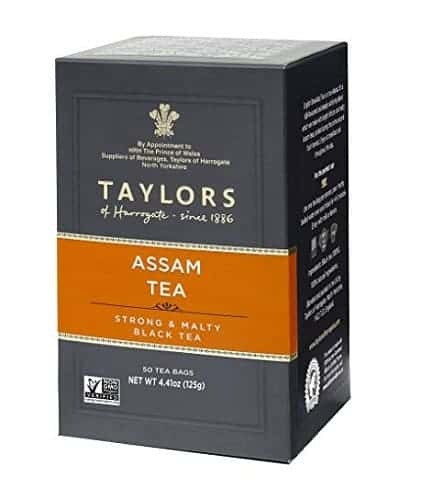 This black tea grown in the Assam Territory has body and a bold, malt flavor. 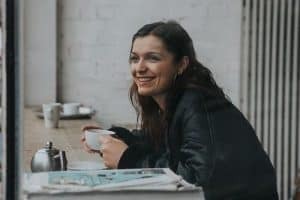 It is a popular breakfast tea all over the world and no wonder – the health benefits alone make this a great beverage. Assam tea increases mental alertness and may prevent ovarian and lung cancer. Traditionally made from tea leaves, butter, water and salt, this is a popular drink in the Himalayan Region. Butter tea is also known as gur gur in the Ladakhi language and offers benefits fitting for high elevations. It is high in calories and is known to prevent chapped lips. As this tea is grown in the southern part of the Western Ghats, it is also known as blue mountain tea. This dark, flavorful and aromatic tea is known to fight diabetes as well as provide weight loss. Nilgiri tea can also help you with your oral health between visits to your dentist. There are several varieties of Darjeeling tea that are popular all over the world. It is thin-bodied and has a distinctive aroma. Some say it is a soothing drink. Health benefits from this beverage include the prevention of gastric ulcers. It is also said to be the best tea in India. Indian tea is typically enjoyed in one of two different ways. Either with milk or without. Blended varieties that are mixed with milk are popular choices such as the Indian chai tea mixes. The typical method used to make Indian tea involves boiling a mixture of water, milk and sugar together before adding the loose-leaf tea. Cover for two minutes then pour into tea cups. To make tea without milk, boil water and pour into a tea cup. Add half a teaspoon of loose-leaf tea and cover for two minutes. Then serve and enjoy. There are no less than 20 different types of India tea. 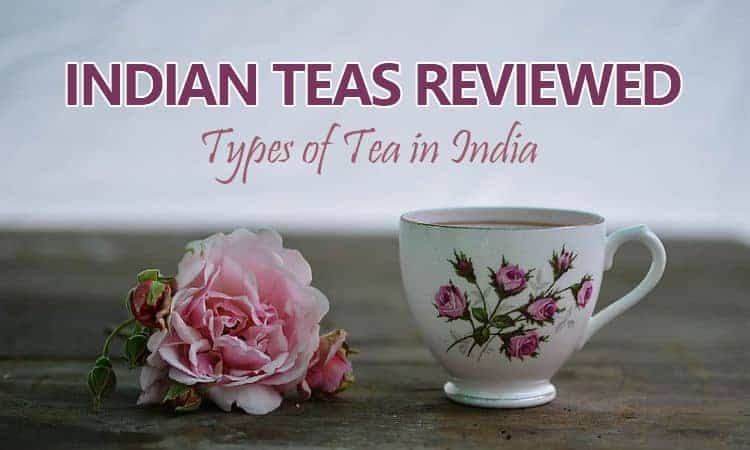 In this section we will break each of them down and describe the tea, where it comes from in India and review a number of them for you. The first tea estate in India was established in the Assam Region in 1837. The tea grown here is at a relatively low elevation in soil that is both rich and loamy. Assam tea accounts for the highest amount of tea produced in the country. This tea is rich, full-bodied and very strong. It tastes malty and has a deep amber color. 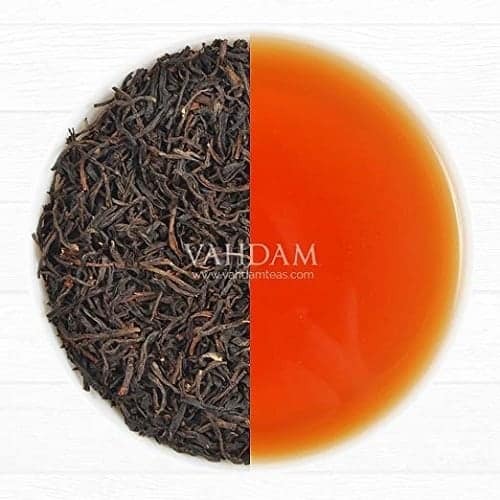 Produced in the Brahmaputra Valley of India, this Assam tea is a powerful, malty beverage. This box contains a total of 50 English-style, tagless tea bags of 2.5-grams of tea leaves. 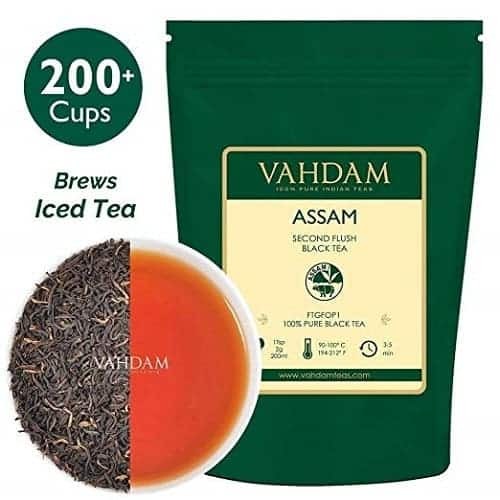 Assam tea is high in antioxidants and this package features 100% natural Assam tea. Blended and packaged in England. This package contains garden fresh Assam loose leaf tea from the most popular tea growing region in the world. 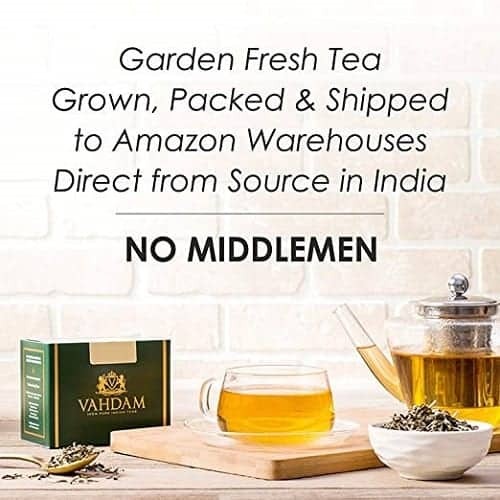 Packed and shipped direct from India, featuring 100% all-natural tea leaves with no additives or added flavors. This ethical, fair-trade supplier supports education of the children from the tea growers’ families and redirects a portion of their profit to that cause. Expect a robust, full-bodied malt flavor that makes this tea a great breakfast or morning pick-me-up. Also backed with a 100% money back guarantee. Tea in the Darjeeling Region is grown in the foothills of the Himalayan Mountains. The plantations, located between 600 and 2,000 meters in elevation, have three harvests (called flushes). The first flush tea is light and aromatic. The second flush tea has more flavor with the final flush producing a tea of lesser quality. The first flush tea is the most expensive of the three with the third flush costing the least. Darjeeling tea is considered one of the finest in the World as it is delicately flavored. There is often a floral or fruit flavor and the tea will be either gold or amber in color. The cool, wet growing region impacts the flavor of this with each flush. 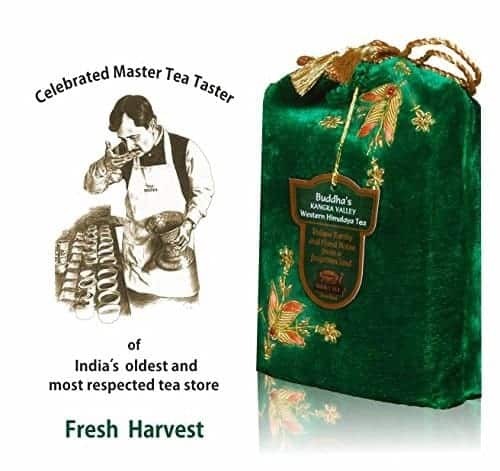 Featuring a total of six boxes of Darjeeling tea with 50 tea bags per box, this is a great volume package. The tea grown in the Darjeeling Region of India is known for a woody aroma and slightly dry and delicate taste. These tea bags contain only natural tea leaves with no artificial ingredients. The package contains a total of 300 tea bags! 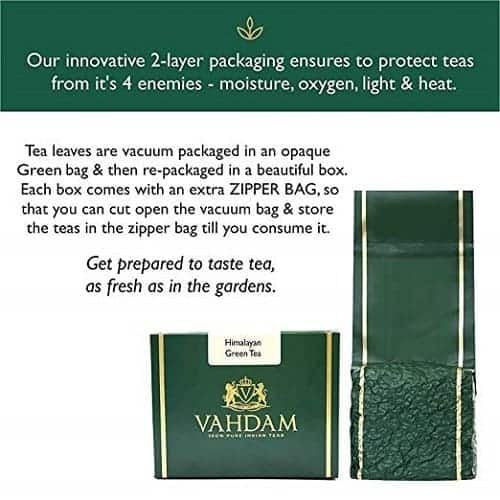 This bulk package of second flush loose leaf tea comes in a double air-sealed aluminum-lined zipper bag to preserve freshness. The 9-ounce/255-gram bulk pack makes an equivalent of 150+ cups of tea. The tea leaves are garden fresh and shipped direct from the plantations in the Darjeeling Region of India. A portion of profits goes back to the farmers as part of the ethical practices of the supplier. This product comes complete with a 100% money back guarantee. The extremely high elevation tea produced in the Nilgiri Region can be found in the Blue Mountains between 1,000 and 2,500 meters in elevation. The first teas grown in the region resulted from plantings in the 1850’s by Europeans. Nilgiri tea has a subtle and elegant flavor that is floral with a creamy feel. They are fragrant and are golden yellow in color. 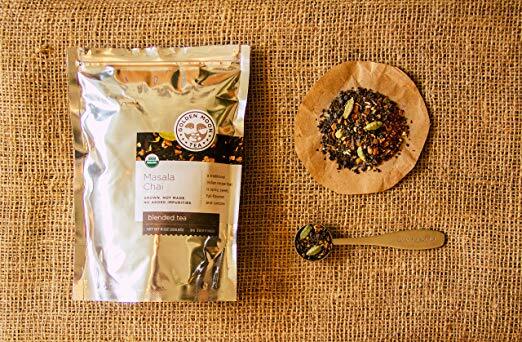 Packaged in a single 8-ounce bulk bag, the loose leaf tea is produced in the Nilgiri Region of India. The tea leaves a broken up in this product and amount to 4 cups of leaves which will produce over 150 cups of tea. This variety of tea leaves also makes a great iced tea drink. The leaves are also suitable for brewing more than once, if desired. Harvested from select gardens in the Nilgiri Region of India, the all-natural tea leaves retain rich flavor and aroma. This package contains 100% pure, unblended Nilgiri tea leaves which can be enjoyed as either a hot or iced tea beverage. The supplier buys direct from the grower as part of their ethical and fair-trade practices. This product comes with a 100% money back guarantee. Although India is best known for growing some of the best black teas on the planet, the Green tea is also worthy of note. Primarily grown in the Assam, Darjeeling, Nilgiri, Sikkim and Dooars Regions, the green teas are known to have distinct aromas and flavor unique to each area. 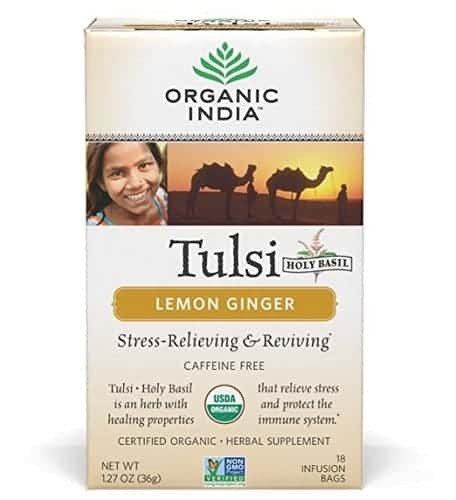 Featuring a blend of three varieties of Tulsi tea leaves (Rama, Vana and Krishna) which results in a perfectly balanced herbal infusion. 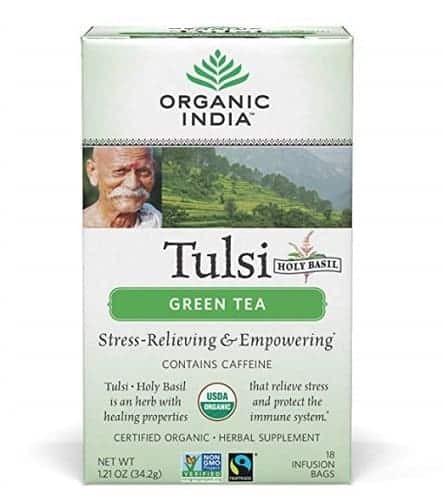 This great green tea in India contains several health benefits including relieving stress, immune system support, increasing stamina and also is loaded with antioxidants. Also 100% certified organic. This package contains 18 tea bags per box. Hand-plucked tea leaves from the high elevation plantations in the Himalayan Mountains are what are contained in this package. This Green Tea is the purest natural detox tea with no additives or artificial flavors. The loose leaf tea is shipped direct from India by an ethical, fair-trade supplier who turns a portion of profits back to the farmers. This product has a money back guarantee. Not a huge quantity of loose leaf tea if you are expecting a lot – this is meant to be used as a short run of 14 days. Tea plants grown in the Assam Region are used for Masala Indian Chai tea. What makes this such a popular beverage is the mixture of herbs, spices, cinnamon and cloves that are added to create a bold, spicy and flavorful drink. It has an aroma where you will note the spices immediately. In a mortar, crush the cloves, cardamom pods and cinnamon, or use a coffee grinder. Transfer the crushed spices to a small saucepan, add the water, ginger and pepper and bring to a boil. Remove the pan from the heat, cover and let steep for 5 minutes. Add the milk and sugar to the pan and bring to a boil. Remove from the heat and add the tea. Cover and let steep for 3 minutes. Stir the chai, then strain it into a warmed teapot or directly into teacups. 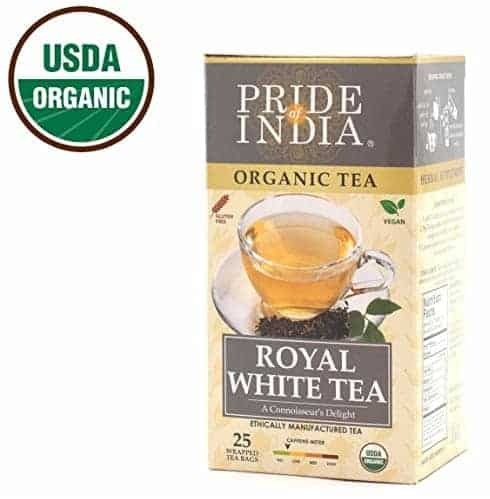 Grown in the Assam Region, the tea leaves used in this package are all-natural, 100% USDA certified organic. There are no added flavors or artificial ingredients. 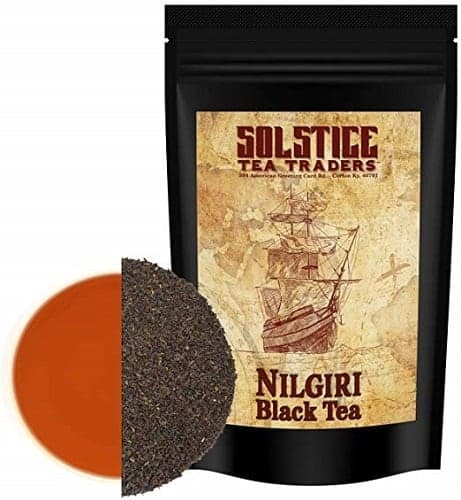 The balance of this spicy and invigorating blend includes spices from South East Asia to create a delicious beverage you will want to drink several times a day. This product features a 90-day 100% money back guarantee. 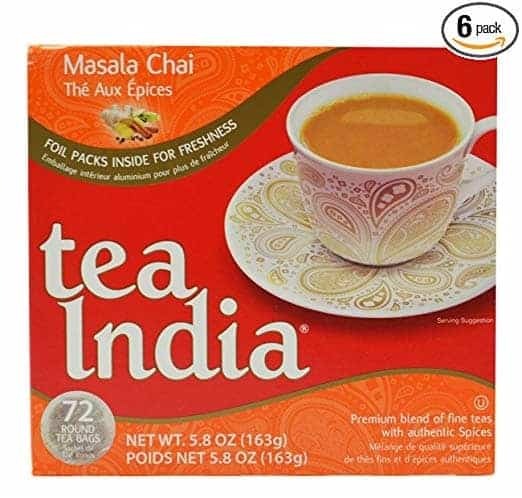 This authentic Masala Chai tea package contains six boxes of 72 tagless tea bags each. There are no artificial flavors as the ingredients contained in each tea bag are 100% natural. The chai tea these bags produce is a lively blend of tea and spices which has a unique aroma and distinct flavor. Each box holds the tea bags in foil to keep them fresh. This is a variation of the traditional tea grown in the Kashmir Region. It is a beverage that is cooked in a samovar – a copper kettle used to brew, boil and serve this tea. Noon Chai is salted and comes in a pinkish color. It is served in other parts of India as well. The mixture in each package contains a perfect balance of fine Green tea leaves, freshly ground cinnamon sticks, crushed cardamom pods, almonds and saffron strands. The tea that is brewed from this combination is rich and has a unique flavor. The tea leaves come direct from India and is vacuum-sealed within 24 to 72 hours of harvesting. The supplier is a supporter of ethical, fair-trade practices and turns a portion of profits back to the local farmers. This product has a 100% money back guarantee. Ginger Chai is essentially as the name implies. It is a mixture of ginger and black tea. The variations range from ground fresh ginger to ginger drops and ginger powder. The tea, often served with milk, has a caramel look and a bold scent of and taste of ginger. As this is an instant chai mix, each packet contains powdered mix. Just add to hot water or milk to enjoy. 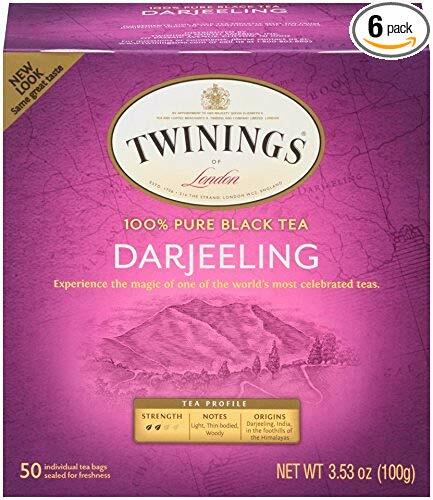 The blend of black tea and spices creates a robust aroma that hints at various spicy combinations with an all-natural taste that will give you a jolt and tease your taste buds. This is another of the popular ‘spice teas’ of India. It is prepared very much like Ginger Chai only this uses Cardamom as the chosen spice. You can grind up the cardamom into a powder for easy mixing with the black tea. This has a strong flavor and aroma of cardamom. This all-natural chai tea contains no preservatives and is packed with nutrient-rich ingredients that are good for your health. The box of tea contains 10 packs, and this is one of several different flavors available from this tea company. The name tells you that all you need to do for a ‘quick tea’ is mix the powder from a single pack into either hot water or hot milk to enjoy. Clove Tea is one more variation of a number of popular Indian spice teas. This particular one requires cloves and once mixed with black tea will be bold with flavor and will also contain a strong aroma. You will smell and taste cloves with this tea which is best served hot. As you can probably tell, various spices used as a tea ingredient are very popular in India. Cinnamon Tea is one such example. Mixed with black tea, ground cinnamon produces a sweet tasting tea that is soothing on the throat and smells absolutely delicious. This variation on the spice tea theme is a tea that features black tea and black pepper with other spices. This tea has a strong aroma and comes with a snappy taste that hints at being rather spicy although it is not, depending on the other herbs that are used in the recipe. Considered a popular breakfast tea, thanks to the bold and bright flavor it has, Irani Chai is a unique beverage. Available mostly in select locations, this beverage is a blend of masala chai tea with additional spices added to give it added power. It is a good morning kick starter. 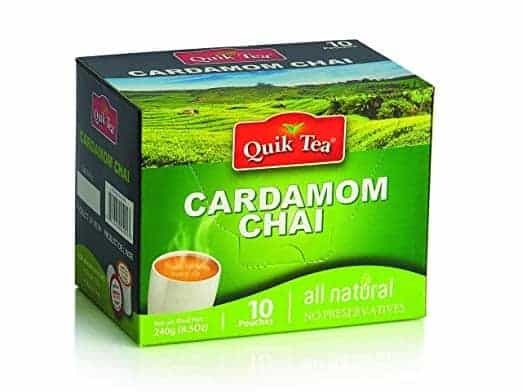 This is probably the newest variety of tea in India. Clay pots are pre-heated to brew the tea which is then served in fresh and clean red clay teacups called kulhads. The unique concept in this tea service results in a beverage that has a slight smoky flavor and aroma. Lemon Tea is a unique mixture of black tea, herbs and spices as well as lemon. The citrus flavor is subtle, but it comes through all the other contents. Known as a healthy beverage to help with digestion, this drink also tastes great. It has a strong lemon scent mixed with other spices. This tea is a blend of three different Tulsi varieties including Rama, Vana and Krishna which creates a stunningly balanced herbal infusion. This mixture is also known to contain several health benefits. 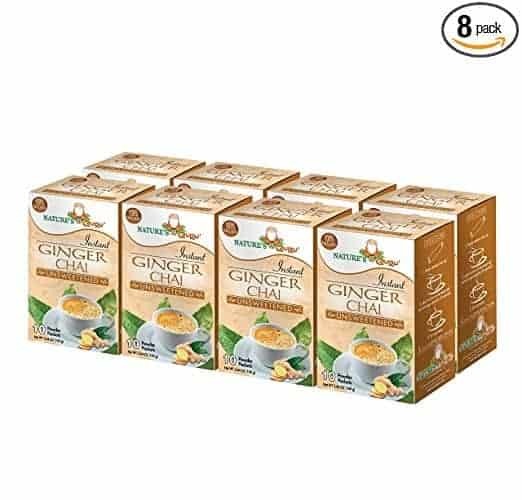 The flavor of this tea is most definitely that of lemon and ginger which makes a soothing and relaxing drink to enjoy anytime. This product is 100% USDA certified organic and the packaging uses recycled materials. There are 18 tea bags per box. Made as a traditional drink by the Himalayans, Butter Tea is a mixture of tea leaves, yak butter and salt. It is a popular drink in the region that borders India, Nepal and Bhutan. It is called Po Cha in Tibet and features a bold and thick salty flavor. The Kangra Region of India was one of the first to produce tea. It currently is responsible for a great deal of the black and green tea in India. Kangra Tea is best known for its distinctive taste and flavor and is considered a standard of all teas grown in India. Packaged and shipped direct from the Kangra Region of India, this box contains 100% unblended tea. There are no artificial flavors or preservatives in this all-natural tea. Officially certified by the Tea Board of India, this specific tea will keep well for up to 24 months. Lemongrass Tea is a blend of black tea leaves and lemongrass. It is more of an herbal tea than anything else and is enjoyed primarily due to the strong citrus scent, flavor and taste. There are health benefits that are associated with this beverage which are related to calming and immunity. Baked in a brass container, Amrut Tulya is an interested mixture of tea leaves, crushed cardamom, fresh ginger and fresh water. Once served, this tea has a bold flavor that is soothing in the mouth. The aroma hints at the spices contained and provide a comforting feeling. White Tea is a common variety grown in India, China and Sri Lanka. It is often referred to as oolong or yellow tea, depending on where it is from. Essentially, white tea is produced from the buds of immature tea leaves. The flavor is subtle and may be weak compared to other teas. 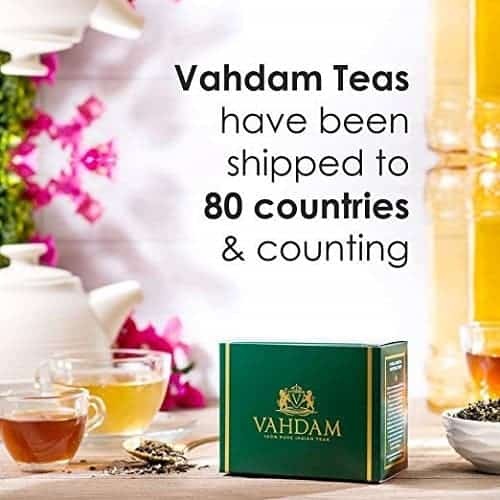 The tea leaves in this product are produced in the high elevation Darjeeling Region of the Himalayans in India. This tea is certified organic and ethically sourced by the distributor. In addition to containing many antioxidants, this tea is gluten-free, GMO-free and all-natural. A total of 25 individually wrapped food-grade tea bags are in this container. The cool, damp Dooars Region is home to tea plantations that grow this variety of tea. The lower elevations, ranging from 90 to 1,750 meters above sea level produce a different kind of drink experience. This tea is full-bodied and smooth with a light flavor. Indian tea is considered the best quality tea grown on Earth. With such productive tea plantations all over the country, you can try a different kind each week and taste the same tea close to just twice a year! For a true tea connoisseur, Indian teas are the standard by which all others are measured. If you haven’t already done so, why not try some of the teas mentioned above today to see what makes Indian tea so great.